Luke is sent to a prison camp, where he gets a reputation as a hard man. The head of the gang hates him, and tries to break him by beating him up. It doesn’t work, and he gains respect. His mother dies, and he escapes, but is caught, escapes again, and is caught again. Donn Pearce and Frank Pierson were nominated for the 1968 Oscar for Best Writing, Screenplay Based on Material from Another Medium. They didn’t win, tho George Kennedy did win for best supporting actor. I like to read classic scripts! 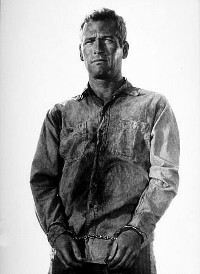 Next to Blade Runner and Butch Cassidy and the sundance Kid, Cool Hand Luke is about my favorite movie. Love your site. I just discovered the miracle that is reading screenplays on the internet for the first time TODAY…so far I’ve gotten through Resovoir Dogs…AND Pulp Fiction..I don’t think I’m gonna make Cool Hand Luke number 3, but I definitly will keep it in mind..PEAcE! !